SOLDOTNA — The members of the House Finance Committee and Gov. Michael J. Dunleavy are both on the road this week, hitting many of the same communities but talking about two different budgets in two very different meetings. Dunleavy kicked off his roadshow in Kenai on March 25, talking to a crowd of about 150 people about his budget plan and the three constitutional amendments that accompany it. Three nights before, Reps. Gary Knopp, R-Kenai, Jennifer Johnston, R-Anchorage, and House Speaker Bryce Edgmon, I-Dillingham, hosted a packed meeting to gather public input before the House develops its own budget. The House Finance Committee is dispatching members to communities all over the state to hold town hall meetings. So far, the meetings have reportedly all been packed with residents; in Kenai, more than 200 people filled the Soldotna Regional Sports Complex to deliver public testimony. Johnston, who serves as vice chair of the House Finance Committee, said she kept a tally in her notes of what the testifiers supported. “I think it was fairly civil,” she said. Though people spoke both for and against Dunleavy’s proposed budget, the majority opposed the cuts and asked for the Legislature to look at taxes and using the Permanent Fund Dividend to pay for government services. Johnston said she noted a lot of support for reducing the PFD. These House Finance meetings are part of the process as the House builds its own budget, she said. The majority of people opposing the cuts mentioned concern about the reductions to K-12 education spending. The Kenai Peninsula Borough School District, which operates 43 schools for approximately 8,800 students, is proposing to cut the majority of its extracurriculars and close five schools, among other cuts, to balance the budget. Pegge Erkeneff, the communications liaison for the district, told the committee members that that doesn’t even meet the cuts they expect. Several people also noted that they appreciated the opportunity to speak at the House Finance Committee meeting, as Dunleavy’s planned meeting on March 25 would not be as open a forum. Dunleavy’s administration also received some pushback after it became public that his roadshow was organized and hosted by Americans for Prosperity. The governor’s meeting was held at the Cannery Lodge, a private facility in Kenai. Attendees were admitted by a Kenai Police Department officer and the gate at the front of the property was closed shortly after the meeting began. 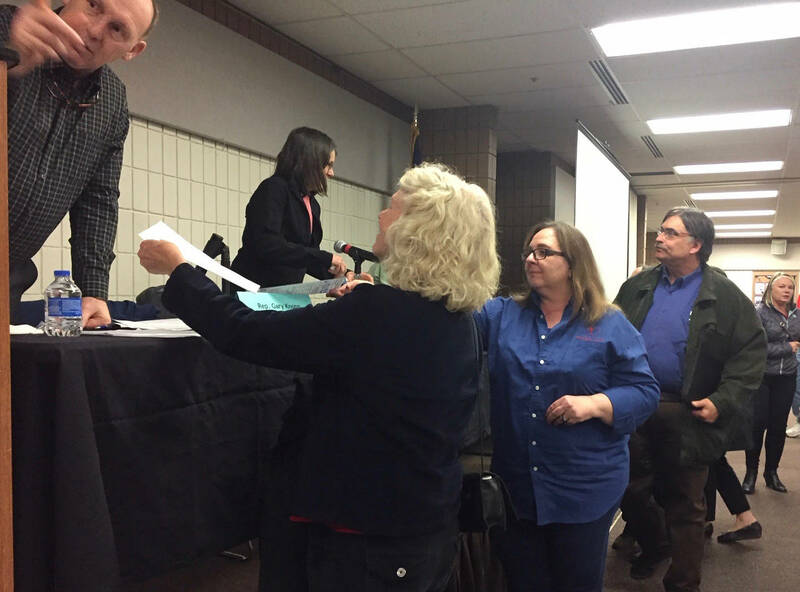 While there was no open planned public comment, attendees at the meeting submitted written questions that could be asked during a panel Q&A session. Ryan McKee, the Alaska state director for Americans for Prosperity, said the group approached the Dunleavy administration several months ago about doing a speaking tour with them and that the timing of the announcement just happened to fall as the House Finance Committee announced its own tour. Dunleavy has worked with AFP in the past, so the organization didn’t feel the meeting was out of place, McKee said. Dunleavy said the partnership with AFP helped the state save money while enabling him to travel and speak to residents about the budget. The organization offered a venue and time, and the administration is willing to work with other partners, he said. Dunleavy brought Alaska Department of Revenue Commissioner Bruce Tangeman, Office of Management and Budget Director Donna Arduin and Alaska Attorney General Kevin Clarkson with him on the tour to talk about both his proposed fiscal year 2020 budget and long-term plans. Much of the discussion lingered over the Legislature’s spending habits, with Dunleavy asserting that the state’s problem is primarily overspending. One of his three proposed constitutional amendments would set a new state spending cap, tying it to inflation and the state’s population. The other two amendments — one enshrining the PFD in the state constitution and the other requiring a public vote before the institution of any new broad-based taxes — are also part of the administration’s long-term fiscal plan. While Americans for Prosperity doesn’t take a formal position on the PFD issues, the group strongly supports a spending cap and the vote before new taxes, similar to Colorado’s Taxpayer Bill of Rights. Clarkson explained that the Legislature has to approve the resolutions for constitutional amendments by a two-thirds majority before they go to a public vote to be ratified. “If you have legislators out there who you are in contact with, you need to let them know that they should be voting for the governor’s amendments,” he said. Tangeman said what the administration has heard is that the House is starting with the fiscal year 2019 budget and planning to go closer to status quo and look at implementing taxes. “There is no way you can tax $7 billion out of our economy,” he said, referring to long-term projections of what would be required to pay for the budget at current annual increases if the Permanent Fund Earnings Reserve account is depleted. Both Dunleavy and the House Finance Committee planned meetings throughout the week in various communities around the state, while the Senate began holding hearings on the first of the constitutional amendments on March 21.